Successfully Added American Dog Web Cam - Computer Video Camera to your Shopping Cart. 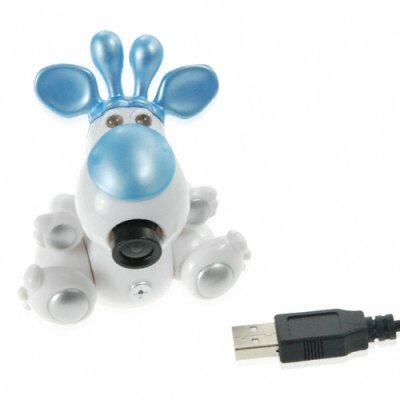 Stylish web camera with a American style puppy design. This handy USB powered plug-and-play webcam will have you connecting to web video calls in moments with high quality and speed. A great computer addition for any person who wants to have fun or conduct business while chatting online. This model contains a 350 kilopixel CMOS sensor and runs at up to 30 FPS to handle all your computer video-calling needs. Adjustable American puppy dog design has a rotating head for optimal aiming of the camera angle, so it is not only cool to look at but also very functional. Another hot electronics product brought to you by your direct from China wholesale direct source, Chinavasion. This is the older version of the web camera. Please click here to see the latest version, in stock now. High quality American Dog character web camera for budget price. The bottom of your dog has a clasp to help keep him firmly in place. Can also be used for recording still pictures and video at home :-).